There are certain dishes I don’t play around with too much. When they’re easy winners with the family, what’s the point of trying to fix something that ain’t broke? Like spaghetti carbonara or bangers and mash. Sometimes simple is best. Cottage pie had always been one of those kinds of meals for me. Cooked minced beef with onions, maybe a vegetable or two, in gravy and topped with creamy mashed potato. Why would you want to mess with that? But the problem is I just do have this tendency to play with my food. I was thinking about ways to make cottage pie go further, you see. Since taking part in the Living Below the Line initiative, where we only had £1 a day for food and drink for five days, the cost of food has been on my mind and I keep looking for ways to make things stretch a bit. I always bulk cottage pie out with a few vegetables, so the idea of adding lentils (or in this case chana dal, split and polished chickpeas) seemed the natural next step. Of course, I could have gone completely vegetarian and left out the beef mince but we do rather like meat in our house, and I think it’s useful to have ways to get more meals out of good meat than have to omit it all together. Once I’d decided to add chana dal, it was a natural leap to add some spice, since chana dal is such a popular ingredient in Indian cookery. I added some cumin and mustard seeds to the mince and dal, and then a little turmeric to melted butter before mashing it into the potato. It could so easily have been one of those disastrous experiments but it worked an absolute treat and the whole family seemed to approve. Well, they asked for seconds. Always a good sign. This is another of those incredibly adaptable dishes. Instead of chana dal, you can use pretty much any kind of lentils or pulses, and throw in whatever vegetables you happen to have in. 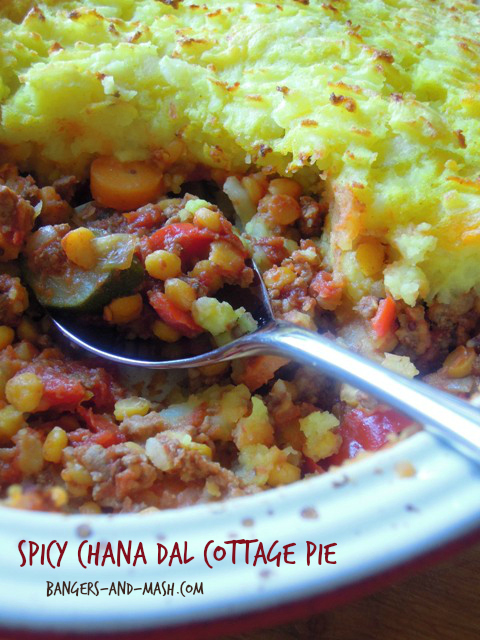 This recipe makes two large cottage pies, each yielding 4 to 6 portions. One for supper tonight and another for the freezer – perfect! 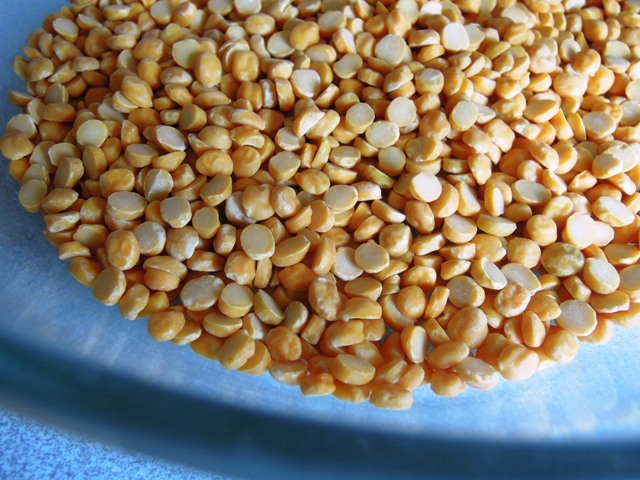 Soak the chana dal in cold water for at least an hour, and then drain. Heat the oil in a large pan and fry the onion until soft and golden. Add the cumin and mustard seeds and fry until the release their aroma. Add the minced beef to the pan and cook for about 5 minutes until browned, stirring frequently. Next add in the carrots, courgettes and garlic and give it all a good mix before stirring in the chana dal, tinned tomatoes and stock. Leave to simmer gently for 20 minutes or so until the liquid has thickened a little and the vegetables are tender. Taste and season. Bring a large pan of salted water to the boil and cook the potatoes until just tender, drain, and return to the pan. Gently melt the butter in a small pan and stir in the turmeric. Pour the yellow butter onto the cooked potatoes, pour in the milk, season with salt and pepper and mash well. Spoon the meat and chana dal filling into two ovenproof dishes, and then cover with the mashed potato. Cook one in the oven for around 25 minutes until the top is golden. Cool the other one before covering with foil and placing in the freezer for a quick easy dinner another night. As this is a great way to make a cottage pie go further, I’m entering it into this month’s Family Foodies challenge where the theme is Cheap & Cheerful. I’m also entering it into the Credit Crunch Munch challenge, the brain child of Fab Food 4 All and Fuss Free Flavours, and this month hosted by Gingey Bites. 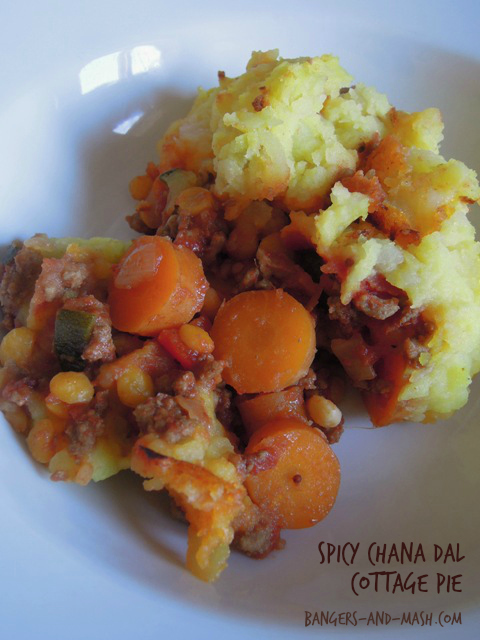 Such a tasty twist on cottage pie. Looks yum. This looks like my kind of comfort food. 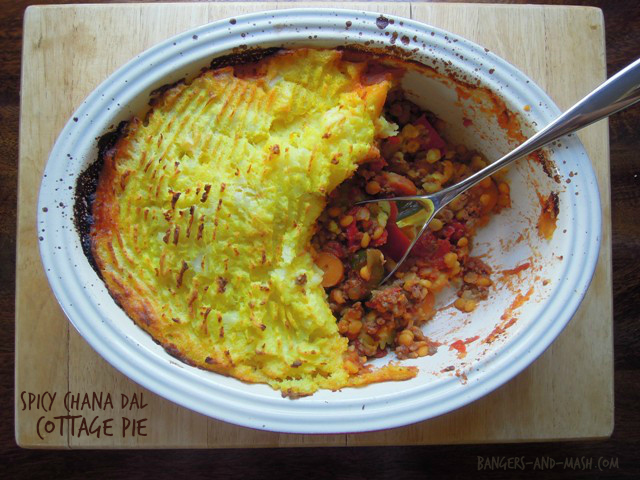 Your chana dhal cottage pie looks good and I might just drop the beefy elements and make it a veggo dish. I’ve really been enjoying your blog – so much so that I’ve nominated you for a Liebster Award, a chance to spread the word about great blogs. If you wish to accept it you can find out more about it on my blog here http://colonialcravings.wordpress.com/2014/05/29/liebster-award/ P.S I love this idea – a real winter warmer. Cottage pie is great for all sorts of tweaks and additions. It is so versatile! I love the idea of adding lentils, beans and pulses. Delicious!